This past summer the MES Executive has been working on the Long-Term Plan so the MES has a consistent plan over the years, even as the leadership changes. I am pleased to share with you the draft version of the Long Term Plan, which can be read below. The Long Term Plan starts with a vision, outlines the major pillars of this vision, and then breaks this down into areas that can be worked on to achieve this vision, and metrics to determine how well the MES is progressing with this plan. The MES Executive is looking for your input on this plan, to ensure that it follows what you, the MES members, feel the spirit of the MES is. 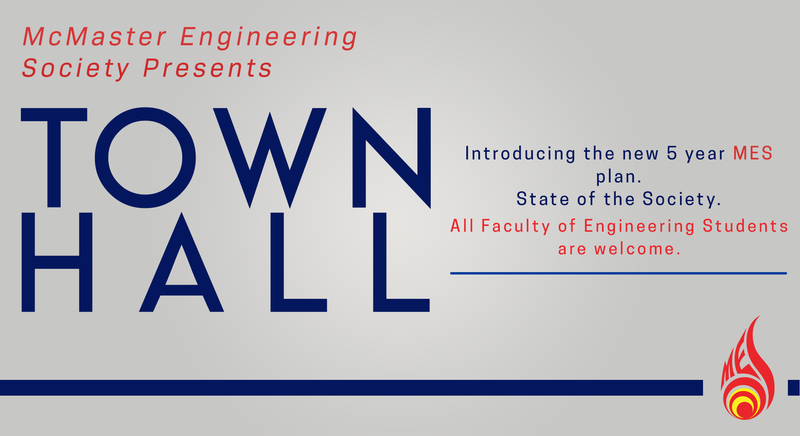 Please read the plan and come out to the Town Hall, here's the link to the event: https://www.facebook.com/events/357929411447922/ The plan is as follows (please ignore any errors due to copying & pasting): The McMaster Engineering Society Long Term Plan Introductory Statement The concept for the McMaster Engineering Society long term came from the 2014-2015 MES Executive. It was formalized by the 2016-2017 MES Council and then prepared by the 2018-2019 Executive for the public. 2018-2019 Editing Timeline First review from Equity and Inclusion Officer in May 2018. Reviewed by Board of Advisors in May 2018. Reviewed by Executive at Exec Retreat in June 2018. ECCS statement reviewed by Kathryn Leistner June 2018. Reviewed by Council in September 2018 Preamble The Long-Term Plan (LTP) is a document which outlines the MES’ guiding principles and long-term goals. The LTP was conceived in 2014. Its purpose is to initiate long-term organizational change, guide executive goal setting, and foster consistency between executive teams. In this way the LTP will help the MES to better realize its mission statement. The plan is based on three pillars which are necessary for the success of the society. If these pillars were met, the MES would be the perfect student society. The purpose of these pillars is to find a value proposition so that all of its members can and will use services which are of value to them. The last major revision of the LTP was conducted by the 2018-2019 executive, who released the document for public viewing and revision. The plan was made with the expectation that it would receive another major revision by the 2023 - 2024 Executive team to ensure that the LTP still accurately represents the needs and expectations of the MES membership. Action Plans Each executive team is required to create an action plan for the coming academic year. The action plans should reflect the long-term strategies above, and how each member will accomplish goals as laid out in the long-term plan. The number of strategies taken on by the executive is at their discretion. Action plans must be completed by July 1st of each year and should be worked on at the executive retreat. Action plans will be presented at the first Board of Advisors meeting and Council meeting of that term and made available for public viewing. Vision All MES members will thrive throughout their time as a McMaster Undergraduate Engineering Student and graduate set up for success. Mission Statement The McMaster Engineering Society will foster the development of well-rounded undergraduate engineering students through accessible support of academics, athletics, and recreational and professional activities, while maintaining the integrity and unique traditions of our faculty society. Three Pillars For Long-Term Success Pillar 1: Increasing Student Engagement Brief: To increase student involvement of all members of the MES Purpose: The vision of the McMaster Engineering Society calls for all MES members to thrive throughout their time as a McMaster Undergraduate Engineering Student; the MES should aim to engage a larger, and more diverse proportion of its membership to work towards fulfilling this aspect of its vision statement. The membership of the MES includes over 5000 students; 5 major groups of students are identified for the MES to target to increase student engagement. The first is first year students who are not yet aware of what the society does. The second is upper year students who have had negative experiences with the society. The third is academic-focused students who perceive the MES as a social club. The fourth group is commuting students whose engagement gets limited due to living far from campus. Our fifth group is International Students. Ideal Future Scenario: The MES engages all students. Pillar 2: Fostering Unity Brief: To unify the clubs, teams, groups, affiliates, and students of the MES. Purpose: Unity is vital within the MES and between its membership, as it allows the MES to operate effectively and it builds the feeling of community within the faculty. This cooperation needs to be fostered on multiple levels: the students of the MES; the engineering programs (iBio, CompSci, Btech, Eng); the clubs and teams affiliated with the MES; the engineering departments; and the students who hold positions within the MES. Part of achieving unity is ensuring all students and groups feel included in and represented by the MES. This requires incorporating the needs and perspectives of students that have previously felt that the MES has not represented them. Ideal Future Scenario: All students, clubs, teams, and members of the MES are unified and support one another, creating a strong sense of community. Pillar 3: Improving the Public Image of the MES Brief: To make the MES be known as a valuable, effective, and committed student organization. Purpose: The quality of the brand of an organization can allow it to better provide for its internal members through valuable community relationships. The MES should work to improve the perception of the MES brand to showcase the valuable services the MES provides and the strong and supportive community within McMaster Engineering. Ideal Future Scenario: The MES is perceived as a valuable addition to the McMaster and local communities to which it belongs. Long Term Plan Implementation Pathways for the MES Welcome Week Welcome Week is often the first experience students have with the McMaster Engineering Society. In order to ensure a successful Welcome Week the McMaster Engineering Society will operate under the following strategic priorities: Diversity of Opportunity and Inclusivity The MES must ensure Welcome Week activities target a larger proportion of the MES student body. To better target a larger proportion of the MES student body, parallel events should be run for a wide range of interests to be represented. No event, service, or tradition should make a student feel unwelcome based on their gender, race, socioeconomic standing, sexual orientation, or disability. Long Term Engagement Welcome Week should have a long-term focus which encourages continued engagement in the engineering community beyond the end of Welcome Week. The MES will work to make incoming students aware of its clubs, teams, groups and affiliates and how to get involved with them. Developing Community Leaders The MES must develop the narrative that engineering students serve to improve the community and the world around them. Humble, confident leadership must be encouraged through the events and engineering representatives present throughout Welcome Week. Interfaculty Relationships To increase the understanding of the MES’s value and to engage students in the broader McMaster community the MES should build on current interfaculty Welcome Week relationships and events and encourage lasting external relationships to continue past the end of Welcome Week. Being Ready for School To increase the first-year student body’s preparedness by ensuring they know how to find Academic Advising, ECCS and other resources to set them up for a successful first year on a professional and academic basis. Student Spaces Student spaces are an excellent way to improve current student experience, welcome new members, and showcase the value of the MES. The MES should ensure the student spaces used regularly by its members, including The Gerald Hatch Centre for Engineering Experiential Learning (GHC), operate under the following strategic priorities: A Welcoming Community Student spaces governed by the MES should foster a culture which is not harmful towards fellow individuals. Students volunteering at the Drain and MES Office must realize they are representing the MES when they are in these locations and must act accordingly to the MES’s values and beliefs. A Welcoming Environment Student Spaces must be welcoming to all students. All spaces under the purview of the MES must be kept clean and tidy. Furthermore, the intended use of these spaces should be clearly known and made accessible. Workplace Safety Culture In order to develop our students as responsible engineers and keep them safe, GHC should emphasize workplace Safety Culture defined as the attitude, beliefs, perceptions and values that students share in relation to safety in the workplace. External Body Relationships The McMaster Engineering Society stands to be a voice for McMaster engineering students in a variety of issues. Through an expansion of its relationships with the following external bodies, the MES can increase its advocacy for all its members and increase the value and credibility of its brand. McMaster Student Union (MSU) & Student Representative Assembly (SRA) The SRA Engineering Caucus is the official voice of engineering students for the MSU. Developing a stronger relationship between the MES, the SRA, and by proxy, the MSU will allow all three organizations to better represent McMaster’s engineering students through policy changes, events, and initiatives under their respective portfolios. Engineering Graduate Society (EGS) The MES should improve relationships with the EGS to provide avenues to increase advocacy for upper year students looking into pursuing a graduate program after graduation, as well as mentoring and support for undergraduate engineering students. Health Science Society (HSS) Students in the IBEHS program within the MES will benefit from a strong relationship with the HSS, both for advocacy reasons, and for a strong social relationship. Degroote Commerce Society (DCS) Students in the Management stream will benefit from a strong relationship with the DCS to improve the advocacy for changes affecting the program. Engineering Students Societies Council of Ontario (ESSCO) & Canadian Federation of Engineering Students (CFES) Improving relationships with both ESSCO and CFES can allow the MES to better advocate on behalf of its membership due to the provincial and national reach of the organizations. The quality of services provided to MES members can also be improved through the help of the organizations by virtue sharing best practices with engineering student societies from across the country. Engineering Coop and Career Services (ECCS) The ECCS provides important services to help MES members in the development of their careers. Working with the ECCS to incorporate student voices into the continued enhancement of the services, as well as increasing student awareness of the services offered will help ensure that the services are effective in their intended purposes. Professional Engineers of Ontario (PEO) & Ontario Society of Professional Engineers (OSPE) Professional Engineers Ontario (PEO) and the Ontario Society of Professional Engineers (OSPE) offer support to engineering students and invest in activities that improve the skills of students. The MES should work to create partnerships with these organizations to benefit its members; focusing on professional development and advocacy. Innovation and Society Living & Learning Community The Innovation and Society Living & Learning Community (LLC) has a heavy influence on a large number of first year engineering students. Fostering a close relationship between the MES and the LLC through integrated events and resources provided to the students of the LLC will help to increase awareness of the value provided by the MES to its members, as well as result in additional pathways for providing value to incoming MES members. Internet Presence Increasingly, the members of the MES communicate most efficiently through use of the internet. The MES should use the internet to showcase its activities, advertise its events and services to its members, and provide information on its policies to the student body to communicate effectively with its membership base. MES Website The MES website should be a welcoming page for non-engaged students, new students, and members of external communities. It should also be a hub of up-to-date information for students looking to gain information on the activities of the MES, or ways to be involved in the MES. Clubs, teams and affiliates of the MES should also be accurately represented on the MES website for proper communication with its members. Social Media Having a presence on a variety of social media platforms should be encouraged in order to ensure students know what activities and services are being offered by the MES, and in what ways students can get involved in said activities. The MES should make sure that social media use is consistent and reaches as many students as possible. Commuting Students Engagement The MES faces issues with engaging its members who do not live in the immediate area around McMaster’s campus. The MES should create events that are accessible to commuting students and ensure that services are offered at times that allow them to be accessible to commuting students. Transitions Effective transitions between executives and councils are a way to ensure consistency in the vision of the MES, and that the work of previous years is continually improved upon. Council Training The MES should ensure that new council members are well trained in their duties, so they can effectively represent their student groups and push the MES further in its mission. Council training is also an avenue through which council bonding can occur, unifying the council. Big Team Meeting (BTM) BTM serves to foster unity and share best practices between MES sub-organizations as well as acquaint newer clubs, affiliates or teams with the operating procedures expected by the MES, the Faculty of Engineering and McMaster University. The MES should continue to develop BTM to encourage the use of MES services, improve the transition of incoming leaders of the MES and MES affiliated clubs and teams, and to increase council engagement. Development of Academic Support Academic Support Feedback The MES provides academic representation to its members to increase the quality of the education provided to the membership. More effective feedback systems for the academic representation stances of the MES will allow the MES to represent its students to the highest standard possible. Relationships with External Academic Bodies The MES works closely with the Faculty of Engineering at McMaster University and the McMaster Students Union to adequately represent its membership on academic matters. The MES should continue to develop strong, yet independent relationships with these bodies to assist in improving the ability of the MES to represent its membership to these bodies. In addition, the MES should continue to reach out for new relationships where applicable to find new avenues for academic support for its membership. Quality of Academic Services In addition to academic representation, the MES provides academic resources and support for its membership. The MES should aim to continually improve the quality of the services provided to its membership to better help its members in their academic pursuits. Transparent Budget Allocation Financial transparency is key since the MES collects mandatory student fees from all of its members who have the right to know where their money is being spent. Information should be regularly supplied to the entire membership body regarding how much they are being charged as well as where that money is going. There are three main components of where the money is allocated; these are: the co-op fee being sent to ECCS, the Mac-Lab fee and the MES Operation’ fee. Co-op Fee to ECCS A portion of the student fees collected go to ECCS; and with it they are able to provide valuable resources to help MES members advance their careers during their studies. That being said there are some members of the MES who are not aware of the value that ECCS provides them, and because of this they do not appreciate this portion of their student fees. The MES should work with the ECCS to provide a breakdown of where student fees are being spent and increase awareness of the resources that they provide. Mac-Lab Fee The Mac-Lab fee is a donation that all MES members pay with their student fees that helps keep our labs up to date and well maintained. Furthermore, students have a voice in deciding what new equipment is invested in. The MES must advertise the fee to students to ensure they are aware of what the money is being allocated to, the value of this contribution, and the that they can opt-out of the fee. MES Operation fee The Operation Fee are funds collected directly from the MES membership; to ensure its members see the value of the MES, transparency of why these funds are necessary must be clearly depicted to the membership. All important information about the allocation of the Operation Fee should be readily available so the entire membership body can be informed and raise any issues regarding the funds if necessary. Transparency with Clubs and Teams The MES should ensure that Clubs and Teams understand the reasoning for any budget decisions which affect their yearly operations. Full disclosure of the explanation behind the budget allocations can help to improve the operating efficiency of clubs and teams and reduce tensions between clubs and teams related to funding from the MES. Metrics for Success Prior to all Board of Advisor meetings, the MES Executive will compile and report the following metrics to gauge the success of the Long-Term Plan. Pillar 1: Increasing Student Engagement Outbound Engagement: Each year the MES will keep track of the total number of attendees to the following events 1. All events hosted by the AVP Events 2. The McMaster Engineering Competition 3. The Event 4. Fireball and Kipling Formal Inbound Engagement Additionally, each year the MES will keep track of the total number of active students on the MES Council and all MES clubs, teams and affiliates. Voter Turnout Percentage of eligible electors who participate in the general MES election. MES Service Summary As a part of each transition report for a service coordinator there must be an assigned metric of overall engagement - publication issues printed, tutoring vouchers distributed, number of trailer rentals, etc. to have a record of year-to-year use of services. Pillar 2: Fostering Unity Big Team Meeting Each year the MES will keep track of the number of clubs, teams and affiliates attending the Big Team Meeting. Conflict and Resource Survey Clubs, Teams, and Affiliates will be sent a survey regarding internal and external sources of conflict they’ve experienced. They will also be polled on the Event Collaboration Keep track of all of the multifaceted events between department clubs and programs, MES Clubs & Teams and other faculties. Department Representation Keeping track of the number of people from each program that show up to our events. Council Engagement Keeping track of the number of non-executive members actively contributing to council throughout the year by examining their attendance at council meetings, council bonding events (training) and the Big Team Meeting. Pillar 3: Improving the Public Image of the MES Members’ Survey The MES will send a survey to its members regarding their perceptions of the society. MES in the News The MES will collect and present all associated news articles. MES Relationships Number of collaborations (events, projects, committees, course changes) with other faculties, and the MSU. Being able to do events with nursing outside of Welcome Week.